The view from inside the Large Underground Xenon (LUX) dark matter detector, which is nearly a mile underground below the Black Hills of South Dakota. The upgraded detector just finished its 20-month run without finding dark matter activity. The incredibly sensitive LUX dark-matter detector, buried under a mile of rock, has come up empty on its 20-month search for dark matter — further narrowing down the possible characteristics of the strange substance. Researchers presented the results today (July 21) at the 11th Identification of Dark Matter Conference (IDM2016) in Sheffield, U.K., which gathers together researchers seeking to understand dark matter, the mysterious material that appears to make up more than four-fifths of the universe's mass, but which scientists have not observed directly. The Davis Cavern in the Sanford Underground Research Facility, which used to be a gold mine, was enlarged and outfitted for the Large Underground Xenon (LUX) experiment. It formerly housed Ray Davis' Nobel Prize-winning solar neutrino experiment. LUX is short for the Large Underground Xenon dark-matter experiment. It rests a mile deep (1.6 km) underground in a former South Dakota gold mine that is now called the Sanford Underground Research Facility. Suspended in a 72,000 gallon (272,500 liter) tank of purified water, a 6-foot-tall (1.8 meter) titanium tank holds one-third of a ton (302 kg) of frigid liquid xenon. The xenon's job is to light up, with a jolt of electrical charge and a faint flash of light caught by surrounding sensors, when a dark-matter particle collides with one of its atoms — and the gallons of water and mile of rock's job is to stop anything else from getting in and disturbing it. This latest result reveals that nothing with the right properties to excite the xenon made it through. "It would have been marvelous if the improved sensitivity had also delivered a clear dark-matter signal," Gaitskell said. "However, what we have observed is consistent with background alone." Even though scientists have never detected dark matter directly, they know it plays an important part in our universe: The way galaxies rotate and the way light bends as it passes by them reveals a substantial amount of extra matter adding to the systems' gravity. LUX was designed to search for weakly interacting massive particles (WIMPs) — a leading candidate for dark matter. Those particles are 10 to 100 times the mass of a proton, but interact only very weakly with ordinary matter (which is why scientists cannot easily detect them). Most particles, such as the cosmic rays that constantly stream down onto Earth, would be stopped by the rock and water shielding around the detector, but WIMPs would be able to make it through — sometimes, if researchers are lucky, knocking into one of the densely packed xenon atoms in the detector and releasing a light signal along the way (liquid xenon is transparent to those photons). Other particles that make it in will likely hit multiple xenon atoms and set off a cascade of light, whereas WIMPs would be lucky to hit one. LUX's lack of detection doesn't mean that dark matter is not made of WIMPs, but it does suggest that dark matter WIMPs cannot have a mass or effect on ordinary matter within a certain range. "Though a positive signal would have been welcome, nature was not so kind!" Cham Ghag, a physicist at University College London and collaborator on LUX, said in another statement. "Nonetheless, a null result is significant as it changes the landscape of the field by constraining models for what dark matter could be beyond anything that existed previously." LUX is one of several efforts to detect dark matter, and its results will help narrow down the searches conducted by future direct-detection experiments, too. 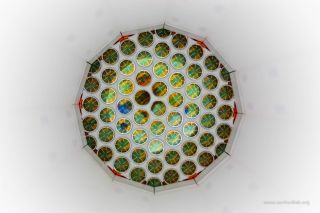 Other experiments, like COUPP-60, the XENON Dark Matter Project in Italy, and the Super Cryogenic Dark Matter Search (SUPERCDMS) have used similar techniques that heavily shield a material and wait for naturally-occurring dark matter to pass through. An experiment at the Large Hadron Collider, on the other hand, has a chance of creating dark matter, and then detecting its signal. "We viewed this as a David and Goliath race between ourselves and the much larger Large Hadron Collider (LHC) at CERN in Geneva," Gaitskell said. "LUX was racing over the last three years to get first evidence of a dark-matter signal. We will now have to wait and see if the new run this year at the LHC will show evidence of dark-matter particles, or if the discovery occurs in the next generation of larger direct detectors." LUX's own next-generation detector, LUX-Zeplin, will have 70 times the sensitivity of LUX, researchers said in the statement — which will take LUX's place underground to continue the search.